We are excited to announce that our application to the ACT Alliance has been formally approved. Community World Service Asia is now a proud ACT member. After going through a comprehensive application process, the ACT Alliance Governing Board approved our membership application in their meeting this May. ACT Alliance is a coalition of more than 140 churches and affiliated organisations working together in over 140 countries to create positive and sustainable change in the lives of poor and marginalised people regardless of their religion, politics, gender, sexual orientation, race or nationality in keeping with the highest international codes and standards. The Alliance is supported by 25,000 staff from member organisations and mobilises about $1.5 billion for its work each year in three targeted areas: humanitarian aid; development; and advocacy. 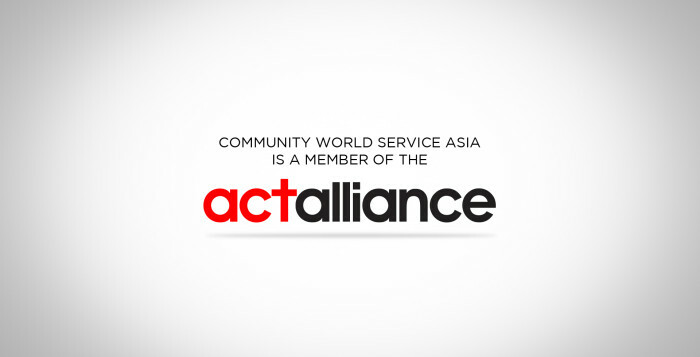 As an ACT member, Community World Service Asia strives to work for positive and sustainable change in the lives of people affected by poverty and injustice through coordinated and effective humanitarian, development, and advocacy work as defined by the Alliance’s united mission. We would also like to take this opportunity to share that Community World Service Asia is the first ever local and regional organization to be a member of the ACT Pakistan Forum. To add further, we are also currently chairing the Pakistan Forum which makes us the first ever local chair in the country. ACT Pakistan Forum is a shared platform composed of Community World Service Asia, Diakonie Katastrophenhilfe (DKH) and Norwegian Church Aid (NCA) Pakistan, who are the members of ACT Alliance presently based in Pakistan and Christian Aid, Church of Sweden and ICCO Cooperation, who are supporting programs in Pakistan from abroad. The forum works with common interests defined broadly by their commitment to the mission, vision, and values of ACT Alliance in humanitarian disaster assistance. The ACT Pakistan Forum is part of the ACT alliance and is not a separate entity which incorporates and reflects ACT policies and guidelines in its own operations. The Forum also provides input into the development of ACT Alliance policies and procedures.